From the team that brought you the bestselling Bradshaw's Handbook comes another fantastic facsimile reproduction - The Battle of Waterloo. 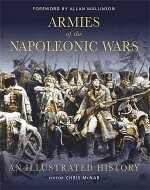 First published in the months after the battle, this unique title gives an unprecedented glimpse into how the battle of Waterloo was viewed in its immediate aftermath. Published to coincide with the 200th anniversary of the battle, this is a collection of reports of the battle from all sides, records of the orders issued to both armies, the official gazette sent by Wellington, the firsthand accounts of French marshals, sobering lists of those killed in the battle, the obituaries of key figures, a full narrative description of the battle and interpretations of the battle on the ground, including letters from the Duke of Wellington. Two beautifully detailed concertinafold maps and a detailed panorama of the battlefield, hand drawn by a survivor of the battle, complete this incredible collection. The narrative description of the battle is provided by "A Near Observer." This is followed by contributions from various sources such as official reports of the battle, orders to the different armies, official gazettes, first-hand accounts from key figures and even obituaries after the battle.